Nyoptics Inc is a well established microscope service and repair company. We are factory trained and authorized by Nikon and Olympus. We have been providing all levels of service to California and Nevada areas since 1971. Our business has grown by ‘word-of-mouth’ advertising – our customers must have been satisfied with our services ...we’re still around after 40 years! We take great pride in workmanship. We are not ‘wipe and swipe’ service operators who clean the top lenses, blow off the dust, wipe down the body, and move on to the next microscope. Inspect components for wear and damage. X/Y stage ,coarse/fine focus, brightfield/darkfield controls, viewport and field/aperature/filter controls. What do we service? We have been trained on most microscope models from nearly all microscope manufacturers. We are factory authorized OLYMPUS and NIKON, and stock replacement parts for most Olympus and Nikon models. Older and obsolete models are our specialty. We have many repair parts and knowledge for very old models in our inventory. We can provide repairs for most microscope models. We have documentation and manuals for most microscopes even including older models from the 50’s, 60’s and 70’s. 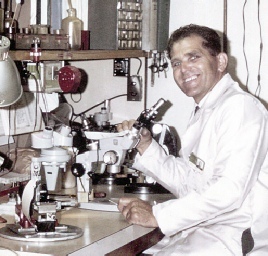 We have been repairing microscopes since 1971 so chances are your model has been seen by our technicians. The microscope will have a 3 month labor warranty from the date the service/repair was performed. Please note that should a problem arise with the microscope during this 3 month coverage period, necessary services will be performed at no labor charge in a prompt manner (the shipping charges are not included in the warranty and would be billable). All parts needed for repairs and maintenance are additional. Exceptions to warranty are for microscope services needed due to abuse, tampering, and drop damage. These are not covered under the warranty and will be quoted and billed separately. If shipping a microscope for repair please ensure all components are properly protected for shipment. We suggest bubble wrap of the microscope modules (multiple layers), place this in a close fit box, then place this box in a larger box filled on all sides with Styrofoam packing ‘peanuts’. This ensures no shifting of the optics during shipment. Do not simply place the wrapped optics in a box of Styrofoam ‘peanuts’ – damage is almost guaranteed.